This is Cloen. Long story behind him. 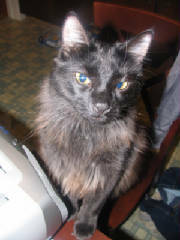 I got him as a kitten as he was abandoned outside frail, weak and cold at my mother's house. She worked full time and I had just left my job for better hours. I tended to him non stop feeding him from a medicine dropper. He was very sickly and I didn't think he'd make it. At the time, I had looked briefly and thought he was a girl. He was very black and furry as you can see and I didn't see any extras. I named in Cloe. Well, as his health improved I took him to the vets for his first real check up, shots and all. Turned out I had a boy. Now, that 's a goof I can honestly say was MY fault. So I had to rename him something close to what he had. My boyfriend suggested adding a letter to change it. "N" Cloen. Perfect. 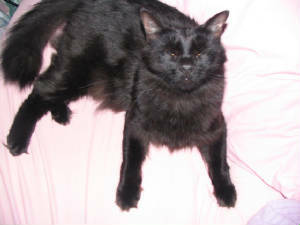 He is a very strong healthy neutered indoor kitty who has learnt that rats rule and that's just how it is. He is very playful and spoiled as he naps with my boyfriend all day. He is very vocal and blats for anything he needs. He is like our Lassie. hehe. He is around two years old. He can be a brat too don't get me wrong. Have any of you ever seen such a sight? This is Cloen inside the boys' cage. Yes, inside. I was visiting my boys when he decided he wanted to visit them too. He jumped up inside and just sat there gawking at the boys. They examined him as well. 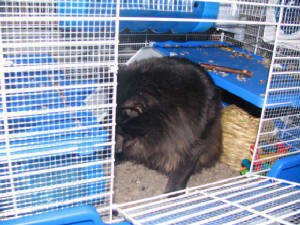 If I was a rattie and a big fat kitty was in my cage I'd be like, "What the?" My rats all get along wonderfully with my cats as the cats do also. They love to play with each other. I am happy because Cloen tries to play with Daisy and she wants no part in it. So it gives something for Cloen to do. He will run really fast through the living room and jump over Isabella and then just look at her. She looks back as if to say,"And now what?" It's very comical. My cats are gentle with the rats. They all know their boundaries. That flash was way too bright for me! This is Daisy. She is around 2 1/2 years old. 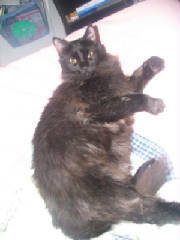 She is a very petite kitty that Cloen tries to play rough with all the time. Poor Daisy. Cloen jumps on her and tries to get her going. She use to take the abuse but now she is finally stepping up to the plate and putting him in his place. The funny thing is she will jump on him, kick and bite him then moments after she'll lick him to death. They are not brother and sister. They come from two different mommies but their moms were sisters. She is very loving and wants attention. She is not allowed near any small animals as she has killed mice, snakes and birds. When we moved to the city, I elected to keep her in even though she was a half and half kitty, half out half in...I felt she'd be safer as far as other animals, cars and protecting the outdoor animals from her elite hunting skills. She is fine with it as I let her and Cloen out on our screened in porch. I have no climbers so that's a great thing since we rent! Cloen has only been outside a couple times as a kitten but he is scared to death if he gets out on accident,then decides it wasn't for him! 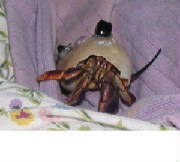 This is my six year old's hermit crab, James. Named after Thomas the tank engine's character. Yes, we had to show you him too! Meet Spritz and Spratz...They are two gerbils that are around 10 months old I am told. I purchased them at a yard sale for $10(you might of read in my about me page). The two gerbils, the cage you see, an aquarium with fish tank cover,food and huge bag of pine shavings(worst stuff for them) Well, they are very sweet and I have them now where I can handle them. I let them out in gerbil balls to run around. And NO! they never meet the rats as the rats will kill them as you know rats might find them tasty. YUK! I have a travel baby playpen from when my son was a baby. I almost gave it to someone who was having a grandbaby then I was like BING bright idea. I can use it for my ratties and gerbils. They haven't discovered they can chew it yet. I have paper towel rolls in there, plastic cups, tissue paper, cloth, baskets, balls, food, water and cotton balls. A variety pack of things to figure out what they are.